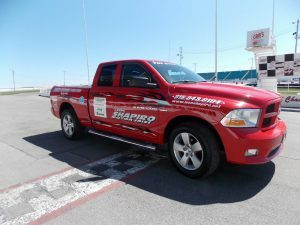 OSWEGO, NY – Leon Shapiro Motor Sales has announced they will again supply a Ram Truck as “The Official Safety Truck & EMS Vehicle” for the 67th season at the Oswego Speedway in 2017. The Ram Pickup, has been voted Motor Trend Magazine “Truck of the Year” three times this decade and was the first ever back-to-back winner of that prestigious award in 2014 and 2015. Properly equipped Ram 1500 and 3500 models get “best in class” fuel economy, both in miles per gallon and miles per tankful, and “best in class” payload and towing capacities, than their closest competitors. Leon Shapiro Motor Sales on 410 W. First St. in Oswego, is the area’s oldest franchised new car dealership and will celebrate its 77th year in business during the 2017 model year after being founded by Leon Shapiro in 1939 at the same location. The available inventory of nearly three hundred units includes used vehicles and nearly two dozen different nameplates for Chrysler, Dodge, Jeep and Ram Truck models. During each racing season, Chrysler unveils a new model to the public and for the summer of 2017, it will be an all-new Jeep Compass which will be on display and for sale at Shapiro Motors. Shapiro Motors, “The Name to Know…in Oswego,” is proud to be a partner and supporter of action at the Steel Palace again in 2017.